A widely published poet in various national and international journals, anthologies and a poet member different poetry groups. Poet Dr Sigma is currently an Asst. Professor of English at VTMNSS College, Trivandrum Dt. Besides being a poet and an article writer, she is also an editor, reviewer and advisory board member in five international Journals. Her areas of research are Feminist studies and Poetry and Poetics. 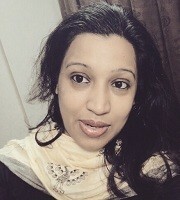 She has got ten years of teaching experience as a lecturer in India and Oman (Oman Ministry Of Manpower as an English lecturer). Summer Dreams is her first poetry collection (available in Amazon, Flipkart and Barnes and noble) and second one is Feminine Blues (soon will be available in Amazon). She contributed research articles in many Research oriented books. American Literary press (Word chimes Anthology, 2006) published few of her poems. Dr Sigma has participated in several prestigious National and international Poetry festivals.